Significant remodeling work can earn a significant tax break in Ukrainian Village and East Village. Many buildings in the two neighborhoods' landmark districts are eligible for 12 years of favorable tax assessments. Remodelers must spend at least 25% of the lowball figure the Cook County Assessor names as market value. Ukrainian Village homeowner Dan Nehm told the East Village Association on April 6 how he got this tax break  which freezes assessments for eight of those years. As city assessments rise, taxes that get an assessment freeze edge lower. Start early on one long piece of paperwork: It can take six months for the city to issue a waiver of building permit fees. Anyone in the landmark districts can get that break, and Nehm, a union carpenter, applies for the waiver every year just in case he works on his home. The permits prove the changes meet landmark-district requirements. The major application, to approve the tax break, goes to the state. Take lots of before-and-after photos and organize your receipts. "You can't just send a shoebox full of records," Nehm said. Plans must meet minimal energy efficiency requirements. Closed cell spray foam insulation is the most effective for old houses, in Nehm's opinion. It costs at least twice as much as fiberglass, but has higher “R” values and is not subject to mold. 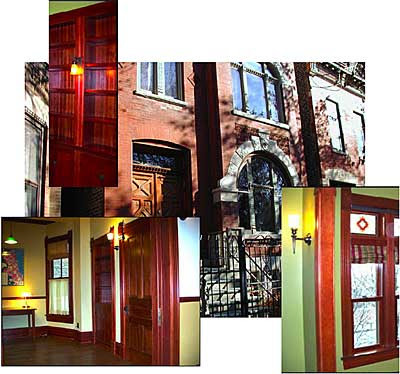 Details on the tax break are available from the Illinois Historic Preservation Agency.